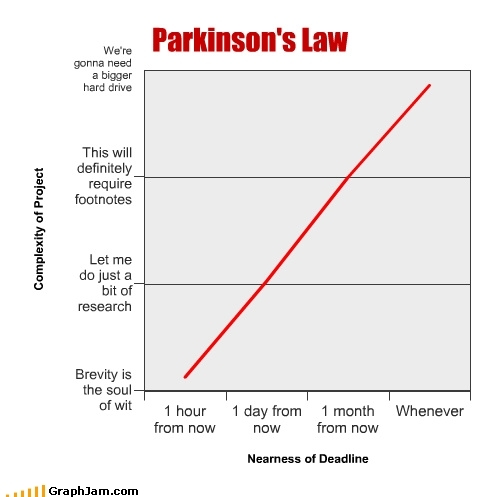 I missed the memo about Parkinson’s Law. 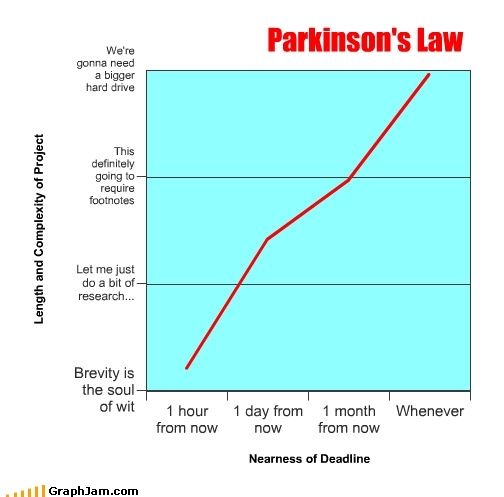 I think I was just dinking around on the internet when I first stumbled across Parkinson’s Law. 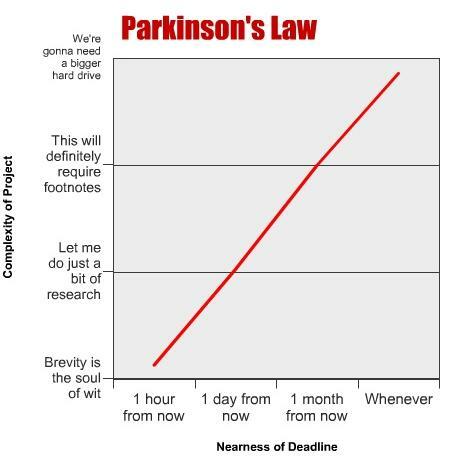 As a tragic procrastinator and dilly-dally-er, I understood the powerful truthfulness of this law immediately. When deadlines are upon me, I can somehow manage to focus my efforts and pare down a project to its very essential components. Whereas when I have seemingly unlimited time, I wander around thinking about this idea and that idea, losing focus and not making much forward progress. I’d like to think that it takes a truly exceptionally intelligent person to be a lawyer, but I don’t really think that’s true. You do, however, have to be relatively quick-witted. And maybe that’s why the Bar Exam is a timed test. Tick Toc, Tick Toc….read, think, write…go, go, go. Heavens, it was stressful. 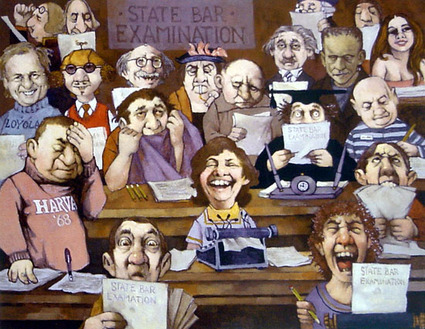 After three days, I emerged from the Bar Exam twitchy and tired, but I was pretty sure that I had passed. And mercifully, I did. As I think back now, I think the pressure of the time limit actually helped me to do better. If I had months to ruminate about each question, I would have over-thought and second-guessed my way into muddled and incorrect answers. But as the clock ticked down the minutes, I was forced to get very clear about the task at hand and to answer quickly and decisively. 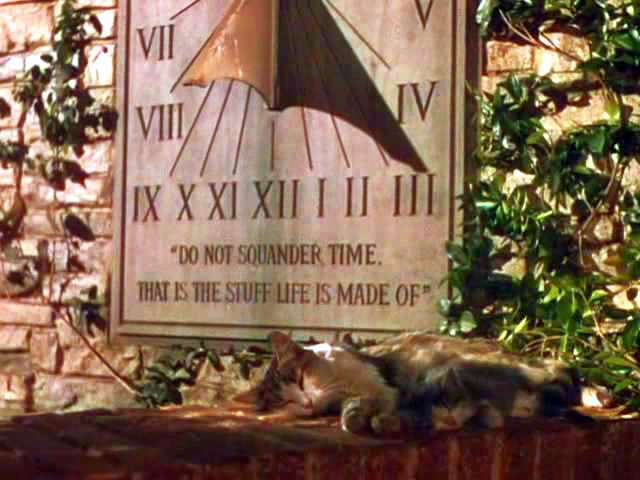 Maybe it’s time to live by the deadlines. Memo received. Agreed. I don’t live by as many deadlines as I’ve set, but agreed all the same. It probably relates to your other post, but I think a similar law exists for waistlines and elastic pants. Something I haven’t managed to do very well, myself. Good luck with Time. It’s been more foe than friend for a while now. Ha! Elastic pants….that’s a good point! I’ve deluded myself into thinking yoga pants don’t count as elastic waist pants, but they are so forgiving that when you wear them all the time, it’s easy to ignore one’s own expansion. I usually go to work in cruelly tailored clothing, so that helps keep me honest, I suppose.